The US$ prices are approximate, the actual cost for these titles may change according to the current DM/$US exchange rate..
Russian Alexandrites. Karl Schmetzer. 2010. Language: English. Alexandrite, a variety of chrysoberyl, and one of the finest colour-change natural gemstones, may almost be called “the national gemstone of Russia”. This great prestige is based on two facts: its noble name in honour of the Tsarevich Alexander Nikolaevich (the future Tsar Alexander II) and its dazzling colours, green in daylight and red in incandescent light, the military colours of Imperial Russia. Although quantities of facetable quality alexandrite are considerably less than those of emerald, alexandrite is counted among and compared to the “big four” of the gem business: diamond – ruby – sapphire – emerald. In this book the authors present an historical overview of emerald mining in the Urals, the discovery of Russian alexandrites in the Uralian emerald mines, the naming and historical use of alexandrites and their appearance and display in mineralogical museums and the gem trade. Morphology and twinning of rough alexandrite is described for single crystals, single contact twins and cyclic twins (trillings). Mineralogical and gemmological properties are thoroughly explained and numerous photo-micrographs of inclusions and growth patterns in faceted samples are presented. 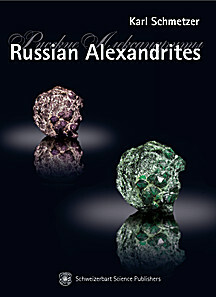 An extensive appendix containing lists of historical names, a time table and numerous references provides valuable information on Russian alexandrites for all researchers in the mineralogical and gemmological fields as well as for gemmological laboratories, jewellers and gem dealers. Volume 1: International Symposium, Halle/Saale, September 21-23, 1998. Bachmann, Gerhard H.; Lerche, Ian (Eds.). 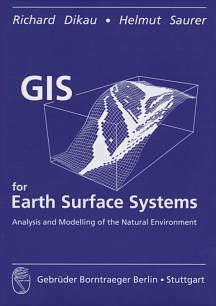 GIS for Earth Surface Systems. Analysis and Modelling of the Natural Environment. Dikau, Richard; Saurer, Helmut. 1999. 'GIS for Earth Surface Systems' illustrates the application of GIS techniques in solving problems of physical geography. The editors found it important to have the book cover the entire process of data transformation and analysis: theory, methods used, data collection techniques, culminating in the selection the best suited GIS technique for the specific purpose, rather than limiting themselves to a discussion of only GIS technologies. 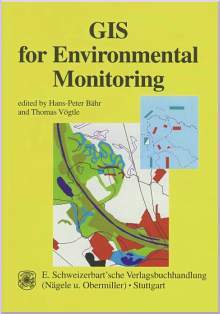 Contributions to this volume discuss the application of GIS-techniques to reach specific research objectives (e.g. snowmelt and precipitation modelling, denudation rates, extraction of morphometric parameters). The papers also highlight present limitations of the GIS-techniques and point out future directions of GIS development and use in physical geography. 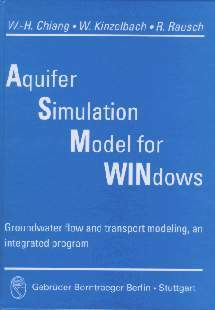 ASM (Aquifer Simulation Model) is a complete implementation of a 2-D groundwater model for use on a PC under MS-Windows(tm). It was originally developed as a tool for the education of students in hydrogeology, civil and environmental engineering. The first version of ASM was published in 1989 and ran under MS-DOS. Since that time ASM has been continually enhanced and improved. This users manual documents the latest and most powerful version 5.0 of ASM which runs under the Microsoft Windows(tm) operating system. The most notable change in this version is the use of a new, friendly graphical user interface which replaces the character oriented interfaces of previous versions. At the same time, ASM-5.0 allows the manipulation of larger model grids which makes it suitable for professional use. It is hoped that this very user-friendly implementation of a groundwater model on Windows(tm) PCs will lower the threshold which inhibits the widespread use of computer based groundwater models. Its ease of use allows getting acquainted with the properties and peculiarities of groundwater flow and transport paths by experimenting with the models by changing relevant parameters. Readers unfamiliar with the theoretical background of groundwater hydraulics and groundwater modelling are referred to the textbooks listed in the references section of this manual. Boden in Niedersachsen. Niedersaechsisches Landesamt fuer Bodenforschung. Chronostratigraphie und Neostratotypen. Miozaen der zentralen Paratethys. Teil II: Strukturformen; Versuche kuenstlicher Nachbildung von Meteoriten; Rinde und schwarze Adern; Relief der Oberflaeche; Gestalt, Zahl und Groesse der Meteoriten; Nachtraege zu Teil I. 1903. VII, 304 S., 23x15 cm. Geodynamik des europaeischen Variszikums. Geodynamics of the European Variscides. Rundgespraeche/Meetings. Geodynamik des europäischen Variszikums. Geodynamics of the European Variscides. Rundgespräche/Meetings. 1.-5. Rundgespräch: veröffentlicht als Beiträge in verschiedenen Heften des Zbl. Geol. Paläont. Teil I. Nähere Informationen auf Anfrage. 7. Rundgespräch, Freiberg, 1991: Aktuelle Probleme der mitteleuropäischen Varisziden: Tiefenbau, Grundgebirge und endogene Lagerstätten. Hrsg. von J. Hofmann und L. Baumann. 1992. VI, 208 S., 51 Abb., 9 Tab., 1 Beil., 23 x 15 cm (Zbl. Geol. Paläont.Teil I, Jhg. 1992, H.1/2) broschiert DM 96/$57. 8. Rundgespräch, Cheb (Böhmen), 1992: Probleme der lithofaziellen, strukturellen und metamorphen Entwicklung der Kristallineinheiten. Herausgegeben von J. Fiala und Z. Vejnar. 1994. IV, 205 S., 1 Taf., 66 Abb., 17 Tab., 24xl5cm (Zbl. Geol. Paläont. Teil I, Jhg. 1992, H. 7/8) broschiert DM 128/$76. 9. Rundgespräch, Wernigerode, 1993: Die altpaläozoische und variszische Entwicklung im nördlichen Mitteleuropa. Hrsg. von M. Schwab. 1995. IV, 532 S., 155 Abb., 28 Tab., 5 Taf., 2 Beil., 24x 15 cm (Zbl. Geol. Paläont. Teil I, Jhg. 1993, H. 9/l0) broschiert DM 228/$135. 10. Meeting, Bayreuth, 1994: First Symposium on Permocarboniferous Igneous Rocks. Study Group Permocarboniferous Igneous Rocks. Bayreuth, Germany Oct.16-20, 1994. Ed. by V. von Seckendorff. 1995. IV, 168 pages, 69 figs., 15 tab., 24x 15 cm (Zbl. Geol. Paläont. Teil I, Jhg. 1994, H. 5/6) paperback DM 68/$40. 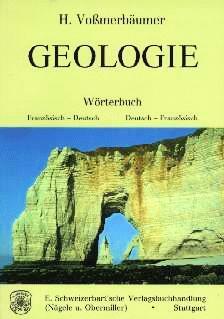 Geologische Jahrbuch (ISSN 0341-6429)- inquire about earlier publications! Reihe B Heft 91. Tessensohn, F. Polar Issue No.7, Intra-Continental Fold Belts CASE 1 West Spitsbergen. ISBN 3-510-95834-9 Due June 1999. Reihe G. Heft 2. due early Fall 1998. Hydrogeologische Kartieranleitung. (ISBN 3-510-95818-7). price not set. Reihne G. Heft 6. due early Fall 1998. UaG- Hintergrundwerte der ad-hoc -AG Geochemie. (ISBN 3-510-95819-5). price not set. Reihe H Heft 3. Atmaca, T. & Muff, R. Economic Viability Analysis prior to Exploration Deposits of Exportable Mineral Raw Materials in Developing Countries in Africa. ISBN 3-510-95835-7 5 figs., 30 tabs., Due March 1999. Reihe H Heft 6. Lorenz, W. & Gwosdz, W. Bewertungskriterien fuer Industrieminerale, Steine und Erden. Teil 3: Quarzrohstoffe. ISBN 3-510-95839-X Due April 1999. Sonderheft I zum Geologisches Jahrbuch Reihe H. Kippenberger, SChr. Beitraege zur Oeko-Bilanz Mineralischer Rohstoffe. Fachliche Einfuehrung/ Methodische Erlaeuterung. ISBN 3-510-95823-3 $20. Geology of East Africa. 1997. Schlueter, Thomas. Beiträge zur regionalen Geologie der Erde, vol. 27. With contributions by Craig Hampton. ``Geology of East Africa'' attempts to provide a synoptic account of the regional geology of Kenya, Tanzania, and Uganda. Much of the presented data are also relevant to the surrounding countries. The new book was written to provide students of East African Geology with a firm basis of knowledge and serve as reference to researchers interested in this region. The volume also addresses scientists visiting or preparing to do work in East Africa as well as the inquiring layman. If very detailed work in East Africa is to be done, the reader will appreciate the literature references cited amply in this book. XII, 484 pages, 191 figs., 15 tab. in the text, 25x17 cm. ISBN: 3-443-11027-4. clothbound. DM 196/ $116. Ce dictionnaire détaillé, comprenant plus de 20000 termes techniques, devrait permettre aux géologues francais d'accéder plus facilement à la litterature des sciences de la terre de leurs confrères d'outre-Rhin. Dans la partie francaise-allemande, les termes techniques de la géologie sond mis en correspondance avec les notions specialisées en allemand et sont enrichis de nombreuses explications et commentaires, y compris, d'ordre linguistique. Pour la partie allemand-francaise, les termes sont presentés sans autre commentaire. H. Vossmerbäumer possède une solide experience de la géologie des deux pays; il participe depuis 20 ans à des stages annuels de l'Office franco-allemand pour la jeunesse, regroupant, dans differéntes régions, des étudiants géologues des Universités de Caen, Munich et Würzburg. Les termes retenus ont été choisis aussi bein à partir des manuels francais et allemands que des travaux scientifiques originaux et concernant les acquisitions les plus récentes. Prof. Dr. Pierre Juignet, Caen. Französisch--deutsches/deutsch--französisches Fachwörterbuch geowissenschaftlicher Begriffe. Mehr als 20000 Termini erleichtern das Auffinden von Fachwörtern und das Übersetzen von geologischen Texten bzw. die Fachkonversationen in der Fremdsprache. Es umfaßt Stichworte aus allen geowissenschaftlichen Disziplinen, von der Paläontologie über die Mineralogie bis zur Geophysik. Mit großer Sorgfalt sind im französisch-deutschen Teil die geowissenschaftlichen Fachwörter den deutschen gegenübergestellt und mit vielen, auch sprachlichen Erläuterungen zur Benutzung angereichert worden. Im deutsch-französischen Teil wurden hingegen die französischen und deutschen Begriffe ohne längeren Kommentar aufgenommen. Fachausdrücke sind sowohl aus französischen Lehrbüchern als auch aus wissenschaftlichen Originalarbeiten ausgewählt worden. Das vorliegende Wörterbuch ist eine unentbehrliche Hilfe bei der Arbeit mit französischen Publikationen sowie der (Fach)-Konversation mit Kollegen aus Frankreich. Geowissenschaftliches Lateinamerika-Kolloquium --- Symposia on Latin-American Geosciences.See Zbl. Geol. Paläont. International Association on the Genesis of Ore Deposits (IAGOD) Symposia. International Geological Congress. Report of the Twenty-Third Session Czechoslovakia 1968. Volume 1: Crystal Chemistry of Minerals. 975 pages, 24x18 cm. Volume 2: Morphology and Phase Equilibria of Minerals. 476 pages, 24x18 cm. Volume 3: Physics of Minerals and Ore Microscopy. 315 pages, 24x18 cm. 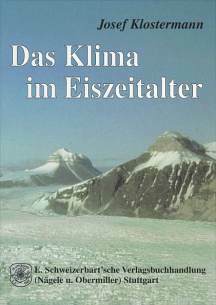 International Union of Geological Sciences, Series A.
Josef Klostermann: Das Klima im Eiszeitalter. [Climate during the ice age.] 1999. Climate, its history and development and climate forecasts have been shifted to the center of attention of mankind. The outstanding importance of this topic is ably manifested in the sharpened interest in the world climate summits held in recent years. Today, we happen to be living in the most recent ice age which began approximately 2.4 million years before present. In order to forecast future climate development and to understand the way past climates have changed, scientists must study the climate of past ice ages, as these data are the only data available; furthermore, the climate of the future is expected to be the climate of an ice age and for this reason similar to past climates. Climate in general, and specifically during ice ages, is controlled by a number of complex individual processes, which are influenced by all other processes via complex feedback loops. These intricacies require a broad interdisciplinary approach to study climates of the past. Krystalinikum. Contributions to the Geology and Petrology of Crystalline Complexes. Arbeiten zu Problemen der Geologie und Petrologie von Kristallingebieten. Wissenschaftlicher Redakteur V. Zoubek. Hrsg. von Z. Misar. 24x17 cm. Die einzelnen Baende erscheinen in zwangloser Folge. Verfuegbarkeit und Preise auf Anfrage. Berechnung bandweise. VERTRIEB: [Verlag der Tschechoslowakischen Akademie der Wissenschaften. Vertrieb fuer die westliche Welt. E. Schweizerbart'sche Verlagsbuchhandlung (Naegele u. Obermiller)]. Lehrbuch der Hydrogeologie. Herausgegeben von Georg Matthess. Leitfossilien. Begruendet von G. Guerich. 2. voellig neu bearb. Auf\/lage. Hrsg. bis 1979 von K. Kroemmelbein, ab 1980 von W. Ziegler. Lotze, F.: Steinsalz und Kalisalze. 2., neubearb. Auflage. Meteor Forschungsergebnisse. Reihe C: Geologie und Geophysik. Redaktion: E. Seibold, H.-J. Duerbaum. Ab Heft 32, 1980. 1980, ff Redaktion: M. Sarnthein, H.-J. Duerbaum. Letztes Hef Nr. 40, 1986. Erschienen sind Hefte 1 (1968)--40 (1986). Verfuegbarkeit und Preise auf Anfrage. ISSN: 0543-5927. Ask publisher for listing and prices. Band 211, H 1/2. Kossler, Annette (Herausgeber); Herrn Prof. Dr. Axel von Hillebrandt zur Vollendung des 65. Lebensjahres gewidmet. ISBN 3-510-66002-1 68 Abb., 6 Tab. Due soon. Niedersaechsische Akademie der Geowissenschaften, Veroeffentlichungen. 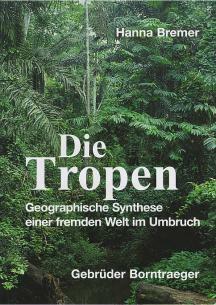 VERTRIEB: ISSN: 0936-7063- contact publisher for this title! Repsold, H. and Mundry, E.: Resistivity Master Curves for Multiple-Point Resistivity Measurements in Boreholes --- Widerstandsabweichungskurven fuer Mehrpunktwiderstandsverfahren in Bohrloechern). Layers of Infinite Thickness --- Normal and Lateral Arrays --- Schichten unendlicher Maechtigkeit --- Normale und Laterale Anordnung. Hrsg. : Bundesanstalt fuer Geowissenschaften und Rohstoffe, Hannover, und die Geologischen Landesaemter in der Bundesrepublik Deutschland. 1990. 311 S., 29x21 cm. Paperback. DM 41. Rosenbusch, Harry F.: Mikroskopische Physiographie der Mineralien und Gesteine. Ein Hilfsbuch bei mikroskopischen Gesteinsstudien. Band I: Die petrographisch wichtigen Mineralien und die Methoden ihrer Untersuchung. Zwei Teile. II. Petrography, Petrophysics, Geochemistry, and Economic Geology. VI, 296 p., 3 pl., 102 fig., 29 tab. Shales and mudstones are the most poorly understood sedimentary rock type. They comprise approximately two thirds of the stratigraphic column and contain the bulk of recorded earth history. In the future, understanding shales will be crucial for a wide variety of studies. Yet, getting a balanced perspective of research on these fascinating rocks is difficult because it is dispersed over so many subdisciplines. 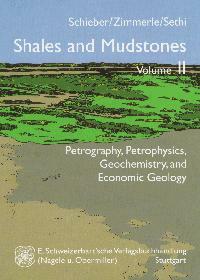 The two volumes of this book present up to date research on a wide range of topics in shale geology, and were assembled with the goal to ease access to this engaging field of research. Chapter introductions were written by experts in their field, and are intended to define the state of the art, to provide access to pertinent literature, and to set the stage for the corresponding research papers. 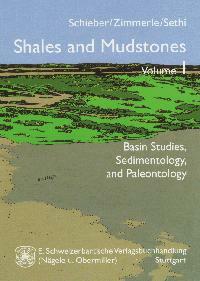 Volume I covers basin-scale analysis, sedimentology and paleontology of shales. Volume II supplements this perspective with detailed treatments of petrography, burial history, petrophysics, geochemistry, and economic aspects of shales. The broad coverage of topics should make this book a valuable source of information for those that want to keep informed about current developments in shale research, and a source of inspiration for those interested to enter this exciting field of study. Teil 1. Methoden der Sediment-Untersuchung. Von G. Mueller. 1964. DM vergriffen, Neuaufl. in Vorbereitung (in preparation). Subsidence Development in the Variscan Cantabrian Orogen and at Cretaceous Passive Continental Margins --- Subsidenz-Entwicklung im kantabrischen Variszikum und an passiven Kontinentalraendern der Kreide. Editors: J. Kullmann, R. Schoenenberg und J. Wiedmann. Symposium Problems of Postmagmatic Ore Deposition, Prague, Sept. 16--21, 1963. With special Reference to the Geochemistry of Ore Veins. VERTRIEB: [Published by the Geological Survey of Czechoslovakia Prague in the Publishing House of the Czechoslovak Academy of Sciences. Distributor for the western world: E. Schweizerbart'sche Verlagsbuchhandlung (Naegele u.Obermiller)]. Taylor, GH. , & M. Teichmueller et al. Organic Petrology. A new handbook incorporating some revised parts of Stach's Textbook of Coal Petrology. With contributions by D. C. Glick et al. 'Organic Petrology' is a new book, but one with antecedents. 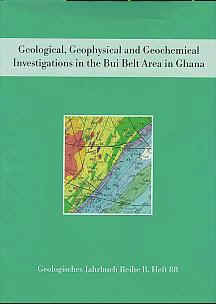 It is rooted in the famous Stach's Textbook of Coal Petrology (1975) and its predecessor Stach's Lehrbuch der Kohlenpetrologie (1935) but has been completely revised and expanded in order to incorporate a huge amount of new data obtained in the two decades since the publication of the 3rd edition of Stach. 'Organic Petrology' now covers the whole field of the petrology of organic material in rocks. 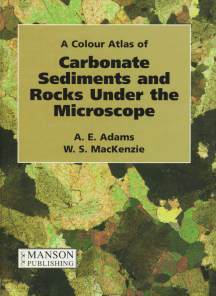 This book, wich is relevant for all those, whose work is related to coal, oil and gas source rocks, and other organic matter which occurs in rocks, deals with: characterization, microstructure; geology and biology of formation of organic matter; maturation and increase in coal rank and the generation of hydrocarbons which takes place concurrently; experimental organic petrology; physical and chemical properties of organic compounds in rocks; industrial processing of coal and the application of organic petrology in solving geological problems (such as determining rates of subsidence, thermal histories). Please refer to the table of contents (overleaf) for more details. Throughout the text, internationally accepted terms were used (International Handbook of Coal Petrology [with amendments], 1963--1993) wherever possible. A new nomenclature known as ICCP System 1994 is being established. Where definitions of this system have been finalized (eg. vitrinite maceral group), we have used them here but where they have not yet been finalized, definitions of the Stopes-Heerlen System (in use for the last thirty years) were applied. Sections which introduce major topics are organized so as to allow easy access to the topic, even for the non-specialist. No field of science can avoid the use of technical terms -- these are explained when they are used for the first time. The text is supplemented by an exhaustive reference list and a subject index. Information on the worldwide stratigraphic distribution of coal deposits and organic matter-bearing rocks, is included in an appendix. Thesaurus deutsch-franzoesisch fuer die Geowissenschaften. Hrsg. : Bundesanstalt fuer Geowissenschaften und Rohstoffe, Hannover. Zeitschrift fuer angewandte Geologie. z-angewandte-l. Hrsg. : Bundesanstalt fuer Geowissenschaften und Rohstoffe, Hannover, und die Geologischen Landesaemter in der Bundesrepublik. Deutschland. Lieferbar ab Band 38 (1992). 1 Band zu 4 Heften pro Jahr. Preis pro Band DM 76.00. Verantwortliche Redaktion: A. Sobe, seit 1996 Dr. Deddo Hagen. Pro Jahr erscheint 1 Band zu 2 Heften. 29x21 cm. DM pro Heft DM 38. ISSN: 0044-2259. ZU BEACHTEN (Attention): ab Band 38/1992 bei uns (All volumes are available). Ältere Bande sind zu beziehen bei: Gesellschaft fuer Umwelt- und Wirtschaftsgeologie mbH Berlin, Invalidenstr. 44, 10115 Berlin -Contact publisher! Zeitschrift fuer Geomorphologie --- Annals of Geomorphology --- Annales de Geomorphologie. Neue Folge. Editor in Chie K.H. Pfeffer. zfg-l. von: D. Barsch, Hanna Bremer, K. M. Clayton u.\,a. R. W. Fairbridge, A. Godard, Horst Hagedorn, H. Heuberger, J. Hoevermann, Karlheinz Kaiser, H. Mensching, A. Pissart, S. Rudberg, O. Slaymaker, T. Suzuki, G. Staeblein, J. I. S. Zonneveld. 24x17 cm. Annually 1 volume (4 issues) is published. Invoicing per volume. ISSN: 0372-8854 - inquire! Africa Kartenwerk (Thematic Maps of Africa). Africa Kartenwerk has four sub series (E,S,W,N) for the east , south, west and north parts of Africa respectively. Blatt S1: Topographie. 1:1 Million. 1980. 78x100 cm. ISBN: 3-443-28028-5. Blatt S2: Geomorphologie. 1:1 Million. 1983. 78x100 cm. ISBN: 3-443-28053-6. Beiheft S2: Kayser, Kurt: T: Geomorphologie Suedafrika. 1986. XII, 105 pp, 25 Fig., 2 Tab., 24x17 cm. ISBN: 3-443-28353-5. Blatt S3: Geologie. 1:1 Million. 1978. 78x100 cm. ISBN: 3-443-28029-3. Beiheft S3: Foerster, Reinhard, Henno Martin & Horst Wachendorf: Geologie Suedafrika. 1982. XIII, 111 pp., 14 Fig., 7 Tab., 2 appendices, 24x17 cm. broschiert. ISBN: 3-443-28329-2. Blatt S4: Bodenkunde. 1:1 Million. 1983. 78x100 cm. ISBN: 3-443-28054-4. Beiheft S4: Fraenzle, Otto: Bodenkunde Suedafrika. 1984. XII, 104 pp., 12 Fig., 18 Tab., 24x17 cm. ISBN: 3-443-28354-3. Blatt S5: Klimageographie. 1:1 Million. 1984. 78x100 cm. ISBN: 3-443-28055-2. Beiheft S5: Fabricius, Adolf Friedrich: Klimageographie Suedafrika. 1988. XIV, 96 pp., 4 Fig., 4 Tab., 24x17 cm. ISBN: 3-443-28355-1. Blatt S7: Vegetationsgeographie. 1:1 Million. 1986. 78x100 cm. ISBN: 3-443-28057-9. 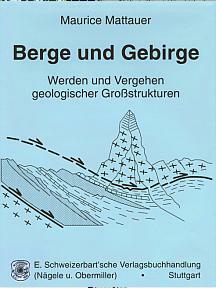 Beiheft S7: Kersberg, Herbert: Vegetationsgeographie. 1996. XVI, 182 pp., 41 Fig., 4 Tab. in Text, 24x17 cm. ISBN: 3-443-28357-8.